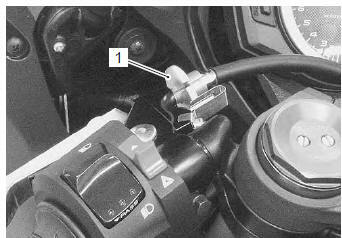 Inspect and adjust the clutch cable play “a” as follows. Turn in the adjuster (1) all the way into the clutch lever assembly. Loosen the lock-nut (2) and turn the clutch cable adjuster (3) to obtain proper cable play. Remove the clutch release adjuster cap (4). 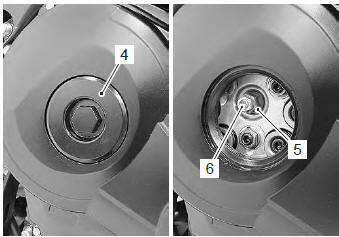 Loosen the lock-nut (5) and turn out the clutch release adjusting screw (6) two or three rotations. From that position, slowly turn in the clutch release adjusting screw (6) until resistance is felt. From this position, turn out the clutch release adjusting screw (6) 1 rotation, and tighten the locknut (5) while holding the screw (6). 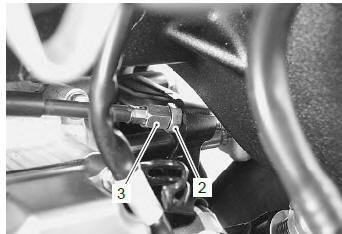 Turn the cable adjuster (3) to obtain 10 – 15 mm (0.4 – 0.6 In) of free play “a” at the clutch lever end. Install the clutch release adjuster cap (4).